“Have you seen our work? Fits perfectly“, Hrvb answered. As Plato once said – beauty (along with everything else – ugliness, ordinariness, weirdness, happiness…) lies in the eye of the beholder. So, watching their walls, I see mostly happiness. There is nothing weird to my eye. “The Weird are coming!“, Artez was tirelessly repeating for months. 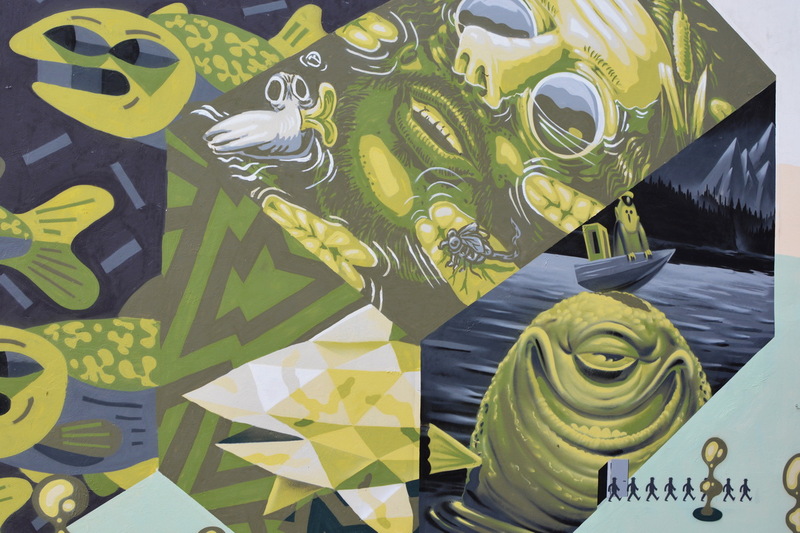 I doubted until the day the event invitation popped up on Facebook: “Belgrade goes WEIRD – Members of The Weird street art crew (Dxtr, Hrvb, Look and Vidam ) are invading Belgrade and Panchevo!“. On the day of the exhibition I had no clue how to approach them nor how to ask for an interview…when Look jumped in front of my camera: “How do you like the show? Are you an artist too? No? What do you do then? You have a street art blog? We must do an interview!” So the mountain comes to Mohammed. 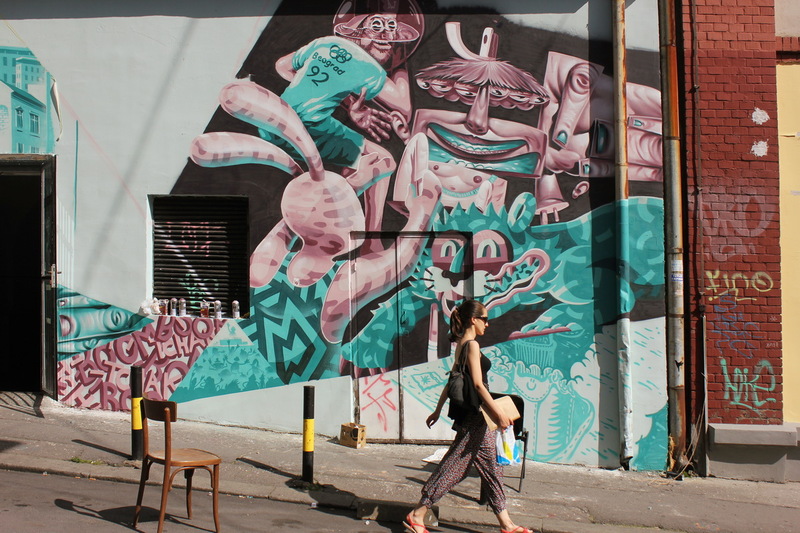 They have painted four murals in Belgrade. The first one is symbol of peace in the KM8 gallery in Kraljevića Marka Street. They have turned a white surface into surreal dance of organic and geometrical shapes. The second piece is on the facade of the gallery. They usually have a freestyle approach, they come to the place and capture its vibe. So the wall in Savamala is the result of what they felt there. 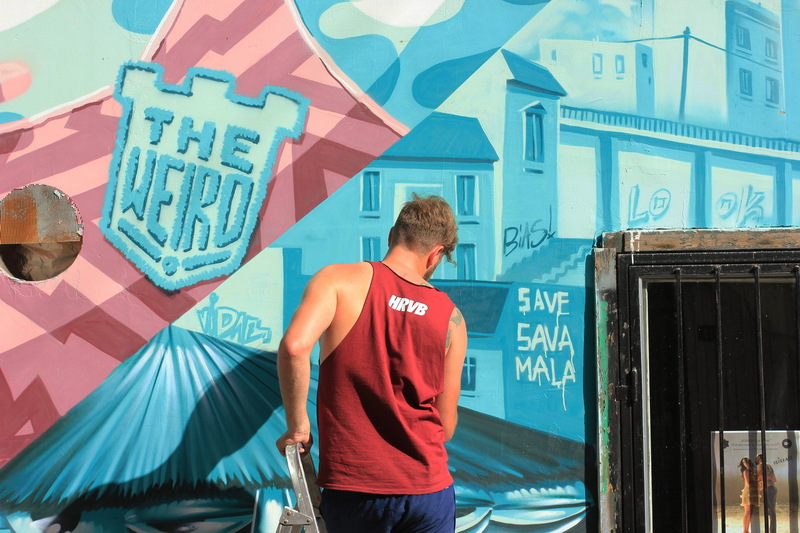 They’ve painted a portrait of the area – architecture and neighbours, the inevitable nightlife, the first word they have learned in Serbian “živeli!” (cheers) and a little rebellion against the latest plans to rebuild and rebrand one of the city’s oldest quarters: “Save Savamala!” wrote Hrvb. 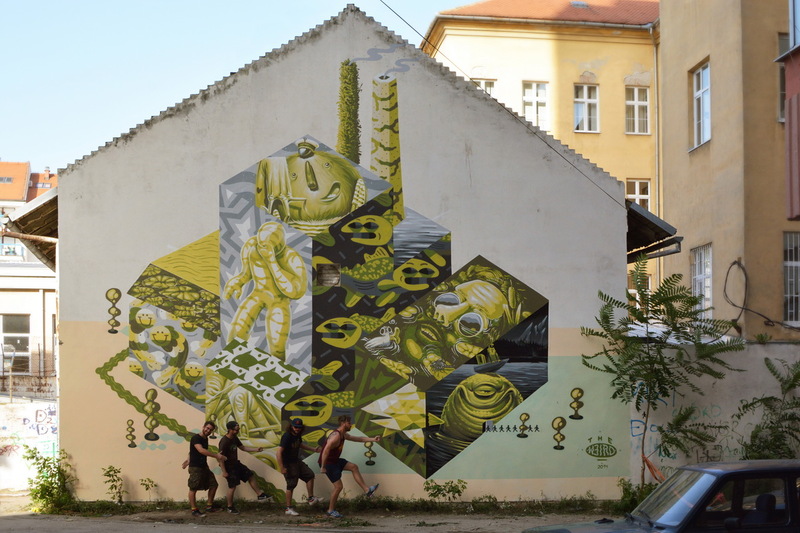 Following the same freestyle pattern they embellished wall in Pančevo with an image of weird factory. The last wall they shared with local artists Junk and Sarin. Despite their tiredness and sweltering heat, they came to the bank of Danube to do one more piece, before they hit the road. “This is our worst piece ever“, concluded both the Weirdos and the locals. I liked it anyway. Be that as it may, atmosphere was perfect – a silly looking situation lives up to the name of the crew! From the boat next to the wall we could hear sounds of the Titanic soundtrack. From a boat! The other occupants of the bank were fishermen, patiently waiting in the muddy shallows. The only catch they could see that day was on the wall – Vidam’s melting dolphin. There is an unwritten rule – after every painting, street artists eat fast food. We took them to the so called ‘Boulevard of food’. Their choice was ‘punjeni Šiš’, meat stuffed with some more meat. “Weird people and weird places are everywhere! We saw only few fragments of the town – Savamala, Inex, Drugstore, party boats, the banks of the Danube… but in each of those places we found so much energy and life and a bit of weirdness, of course”, said Hrvb. I met some sweet and friendly people. So I gave up the idea of doing a proper interview. There already are loads of ‘how, what, why’ guides online. Instead, I decided to write about their Belgrade escapades.